The stay was fine. Only issue was the smell of cooking from other rooms. My two-week stay was very enjoyable. The hotel was clean and well located. I had a large suite with separate kitchen, dining and living area. These were well equipped and laid out. There were only two issues: the room temperature was a little too hot and I could not adjust the temperature level; also, the shower configuration did not work well - the shower head pointed across the bathtubt. The appartment is in a good location, pleaseant front of house and adequately furnished. Breakfast was fresh with rreasonable choice. I have stayed at both the Novotel and Ibis in Geneva and the Adagio sits comfortably in the middle. Great hotel for work trip; would stay again! Had a great experience. Stayed for a work trip and the location was extremely convenient and close to many restaurants. The room had a kitchenette, which was great to cook a few meals while I was there. The room was a little too warm so had to open a window to sleep; would be great to adjust the heat or allow the thermostat to be managed within the room! Cleaning might be better and the room was super hot! The location of the hotel is excellent, the staff is helpful, but the temperature in the room was difficult to adjust. The room was very warm and uncomfortable. A spilt of Prosecco on my birthday! 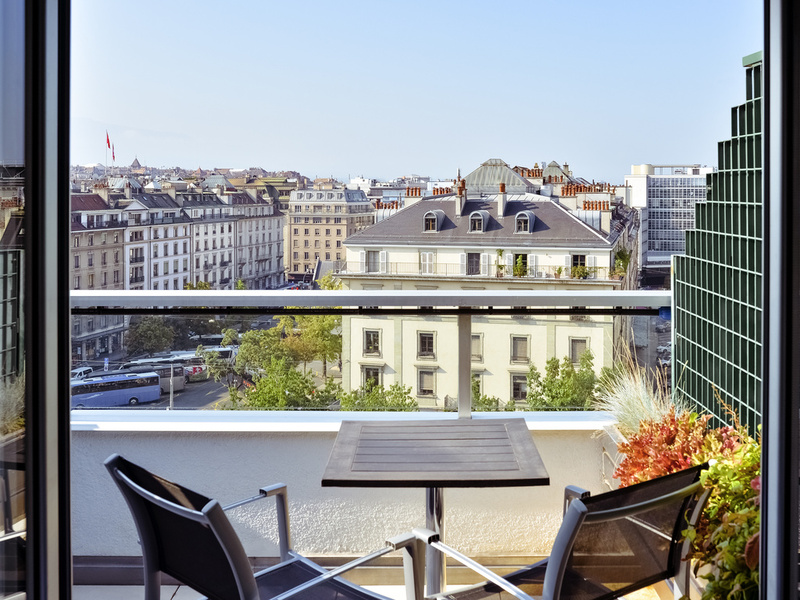 I enjoyed my stay at the Aparthotel Adagio Genève Mont-Blanc. The staff and room met or exceeded my expectations. The complimentary split of Prosecco on my birthday was a very thoughtful surprise. Smal room, room too warm and too noisy. This time a got a smaller room than usual and facing towards the park so very noisy when the window needed to be open because of lack of fresh and not too hot air. Unfortunately I got very noisy neighbors in the next room and this was made worse by the single door between the two rooms. I had a positive experience, rooms were very clean. I very much enjoyed the little kitchenette which even had the cooking utensils, which I used frequently. The reception team and the breakfast team were very warm, welcoming and active. The location is so ideal as it’s close to the lake and the station. Well laid out apartment room with separate kitchenette, clean and modern, good location close to the lake. Reception staff were helpful and friendly and hotel is in a really good location. We stayed in a balcony studio (2 nights) and it was nice and clean but felt very stuffy, we adjusted the air con but ventilation was poor. Someone must have smoking in another room as we could smell it quite strongly. Not nice! The under counter lights didn’t work and there were no instructions with the nespresso/microwave etc. Easy enough to sort - if in doubt - You Tube. Overall the room could do with a little love. When we made our selection we noticed there were refurbished studios (no balcony) perhaps we will try that next time. Room was nice. My first impression of the service staff was unfortunately, bad. We wanted to get a late check-out for the next day and when we enquired about it, the first guy who served us said it would cost 50 franc. However, when we decided to get a late check-out later on, the second guy who served us charged us 40 franc. I am unsure if the first person was confused over the price, but it gave us the impression that he was trying to con us of 10 franc. Concierge very friendly and helpful; good size room and facilities, clean; good breakfast options. Was a bit too warm and grateful I could open the window. Unfortunately the whole week there was a lot of noise from other hotel guests either coming through the walls (which were thin) or from talking loudly in the hallway. I was very glad I packed ear plugs. The experience could be very much improved through having a 'quiet stay' section or improving sound barriers in the rooms. The room was small . The Adagio Genève provided a perfect base for our full day in Geneva. Close to the lake and other amenities, we were able to have a lovely day in the crisp January sun.